Dr. Cozzolino has been a practicing podiatrist for about 25 years. A graduate of Ohio Weslyan University, he attended medical school at the New York College of Podiatric Medicine and completed his residency at Saint Barnabas hospital in the Bronx in New York, where he was named chief resident during his second and final year. Dr. Cozzolino has had exposure to multiple modalities and, thanks to his residency at Saint Barnabas hospital, has been able to assist on spinal surgeries and other various orthopedic operations, not ordinarily involved in a standard podiatric residency. 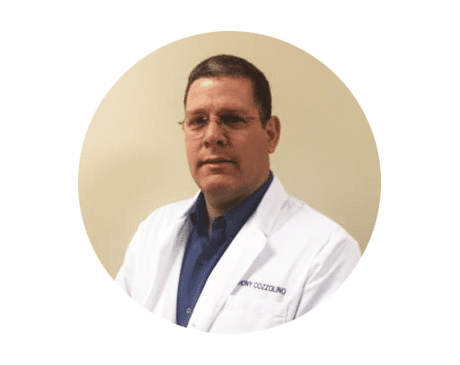 After completing his residency, Dr. Cozzolino earned Board certification in foot surgery and joined the Central Long Island Podiatry Group (now known as the Long Island Podiatry Group), one of the premiere podiatric offices in Long Island. He remained there until 2004. He relocated to Ohio to be closer to family and has been practicing as a sole proprietor here since 2006. Active in the Ohio Foot and Ankle Medical Association, Dr. Cozzolino has made it a personal goal to advance the profession’s ability to provide quality foot and ankle care statewide. In his spare time, he enjoys spending time with family and tinkering with his restored cars. Dr. Cozzolino specializes in reconstructive foot surgery, advanced wound care and limb salvage, and soft tissue procedures of the rear foot and ankle. His passion to heal patients with complex wound complications has lead him on his journey to becoming a well-renowned expert in the field; providing care at hospital wound care and hyperbaric oxygen centers in Columbus. We have made it a point to participate in as many insurance plans as possible, and work with them to maximize your benefits. Below is a current list of some of the plans in which our practice participates. If you don’t see your insurance plan below, please call and check with us, as we are always looking to add new plans.